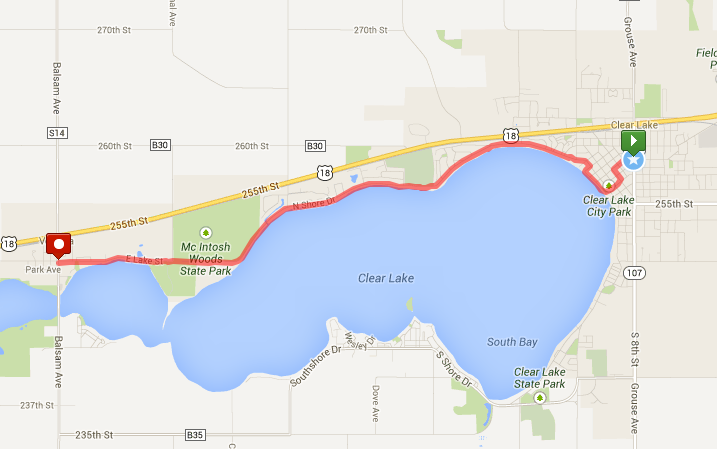 I relocated to Clear Lake, Iowa from Rochester, Minnesota in 2010, one month before my daughter was born. Looking back, that was probably the craziest thing I had done to date until I signed myself up to do this for Steve’s site. I’ll get to the reason(s) I run a little later, but I normally cap a single session at around the 3 to 3.5 mile mark so this was really stretching it. My cause of choice was the Greg Leonard Benefit Fund. Greg is the brother in law of some friends from high school who was diagnosed with ALS last December. The goal was to send he and his family to Disney this summer to enjoy all that the Magic Kingdom has to offer. I know this is a cause near and dear to Steve’s heart so it seemed like a perfect match! 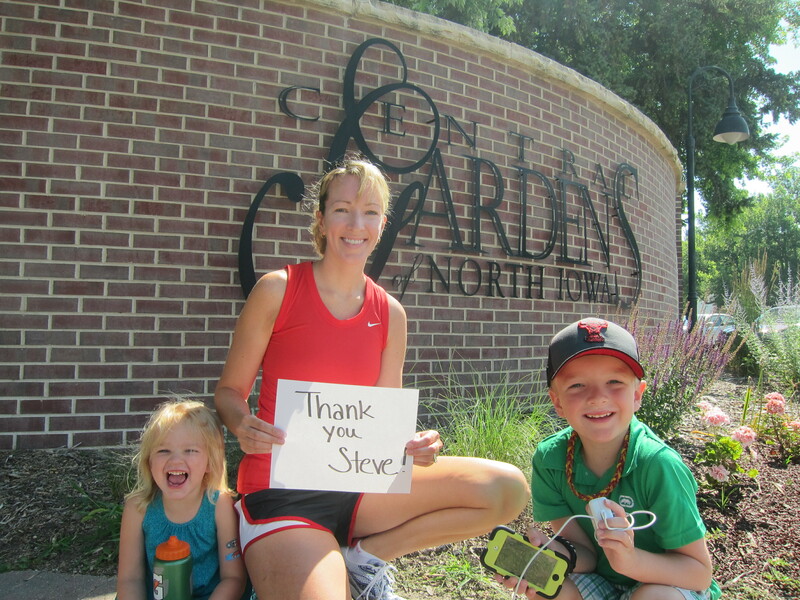 The official beginning of my route was across the street, but I wanted to make a quick stop at North Iowa Central Gardens to thank Steve for being an inspiration to do what we can to make the world a better place. So, after a quick shout out, I ran all of a quarter of a block to my first stop. 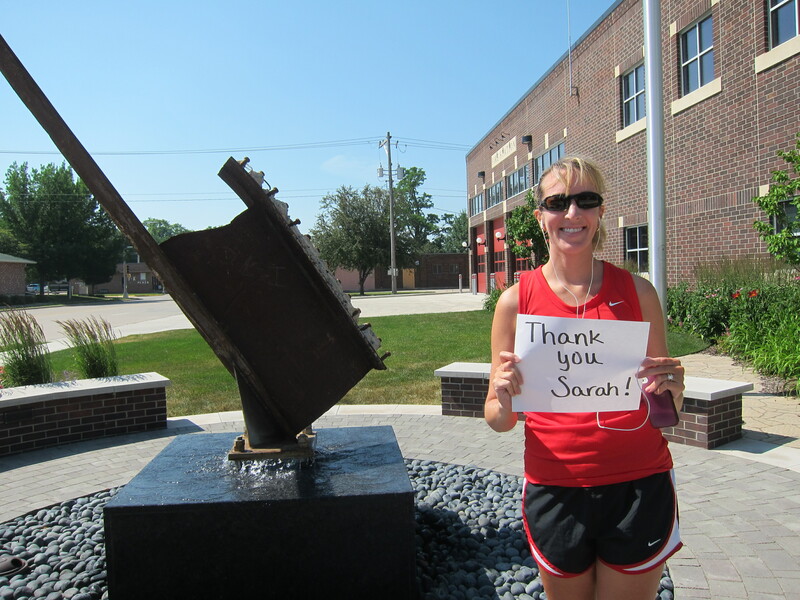 I started my official run at the Clear Lake Fire Station by the World Trade Center memorial. Local firefighters made the trip to NYC to visit a warehouse full of debris in 2011 and brought back a piece of steel given to them by the 9/11 Families and the Port Authority of NY/NJ. It is a touching tribute to those who lost their lives that day and the unveiling was a spectacular event. The group was escorted by different emergency vehicles in the towns they passed through on the way home with people lining the streets to pay their respects. 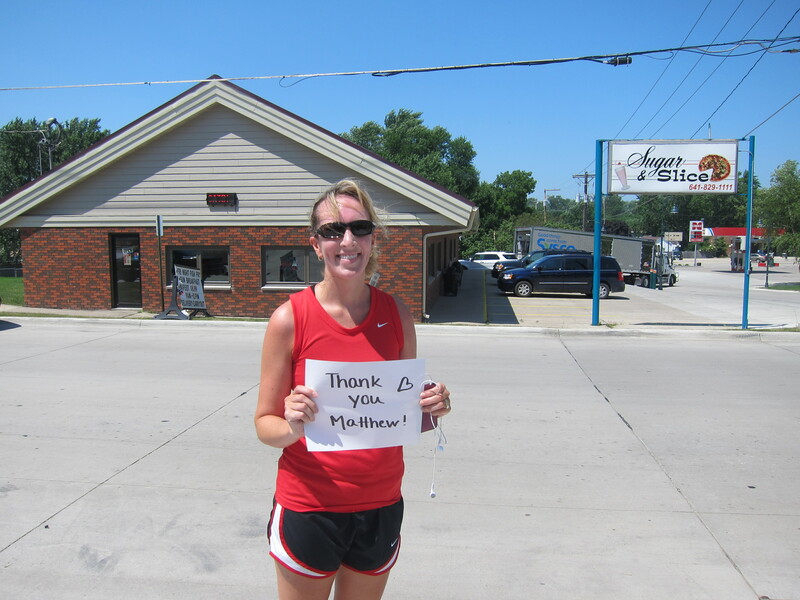 I have chosen to thank the people who first crossed my path in Clear Lake beginning with my friend Sarah. Her husband Josh is a volunteer firefighter here so it makes sense that she’s first up. Moving to a new town can be a scary ordeal, but she made me feel right at home within the first few months when I met her at swimming lessons. As an added bonus, two of her four kids are exactly the same ages as mine and already knew each other from daycare so they helped to break the ice. Thank you Sarah for being you and letting me be me. 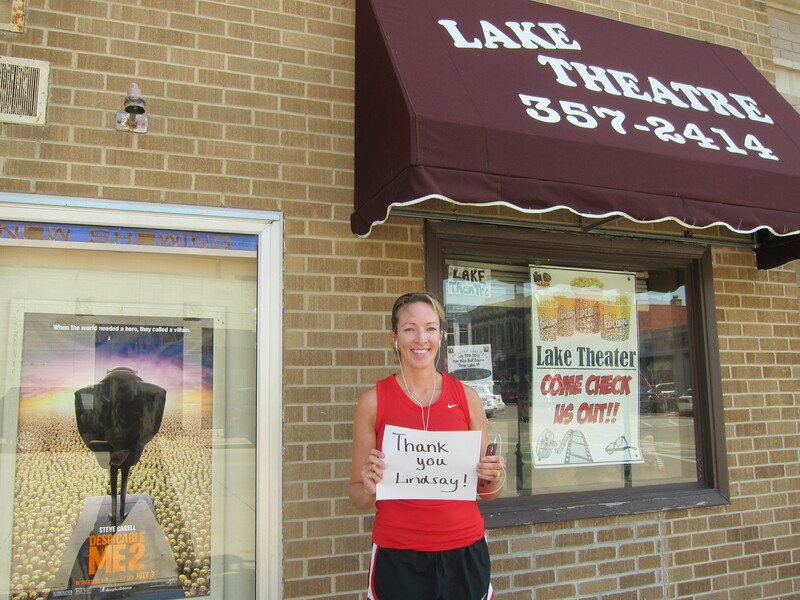 My next stop was the Lake Theatre, which we have really enjoyed since moving to town. Where else can you get popcorn, pop and snacks for the whole family plus tickets for less than $20? This place is great and always has a decent selection of the latest movies throughout the year. This is where Lindsay and I saw Footloose, with only one other person in the audience, which made it possible to sing along as loud as we wanted through every single song. Lindsay had a hand in recruiting Matt back to the area so she was the one who got to field all my questions about why we should move here in the first place. Clearly she excels at her job because we made the leap! Thank you Lindsay for all of the Friday Fun Days we’ve had on the lake, introducing me to your hair-do girl and regularly scheduled family nights at Pizza Ranch. 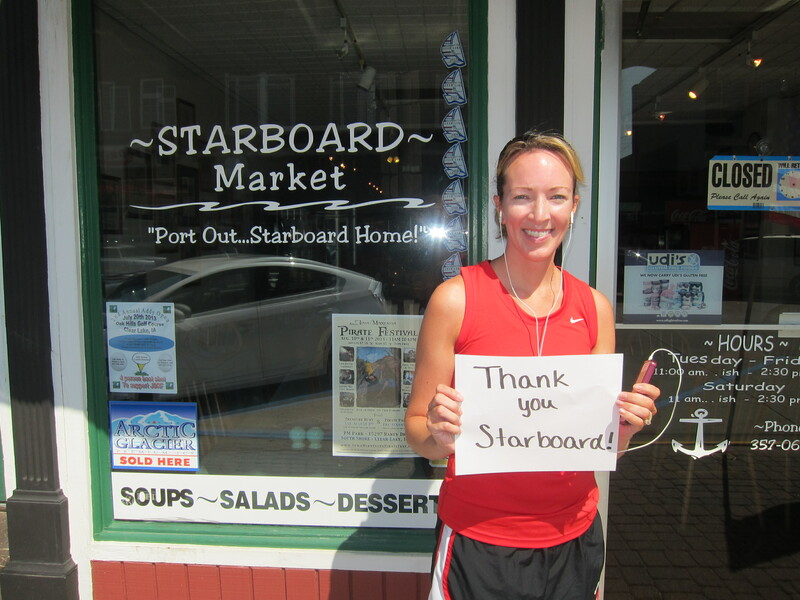 Next stop, Starboard! This is why I run. Or half the time it’s my excuse why I’m too full to even think about hitting the pavement. Everything here is delicious from the sandwiches, soups and salads to the mouth-watering desserts. We eat here at least a couple of times a week and usually on the weekend too. The outdoor seating in the summer is perfect and the crew is just as fabulous as the food. 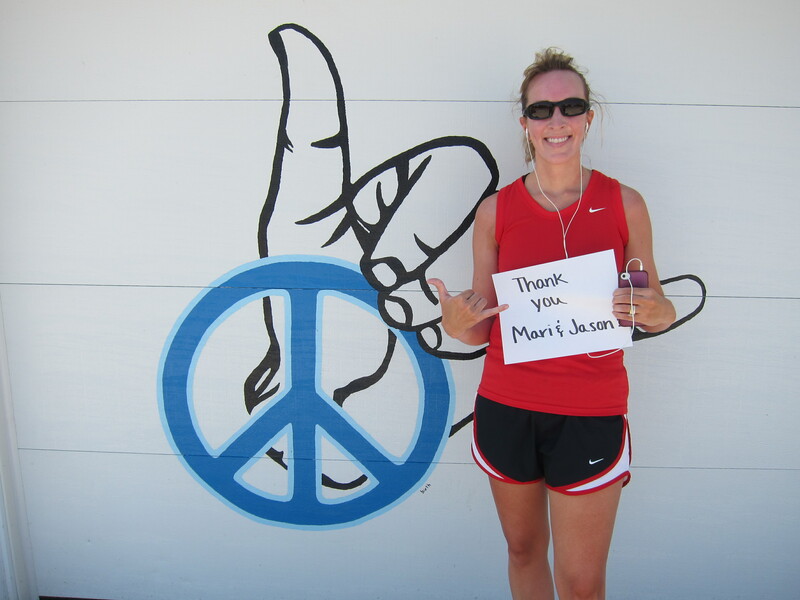 Thank you Jen and Dude for giving me a reason to run, even if it is just to counteract the calories. Just down the street is the Sea Wall where everyone gathers to play at the beach or you can get your Starboard lunch to go and watch the boats on the water. The kids love the splash pad and of course the giant Lady of the Lake paddleboat that’s a must if you want a quick tour with a little back story of town thrown in. I want to thank my friend Stephanie even though she’s technically part of my Rochester life. We might actually see each other more now than when we lived in MN. It’s always fun to see old friends and I appreciate that she makes the drive down I-35 to have a pina colada and catch up while the kids have fun playing together. 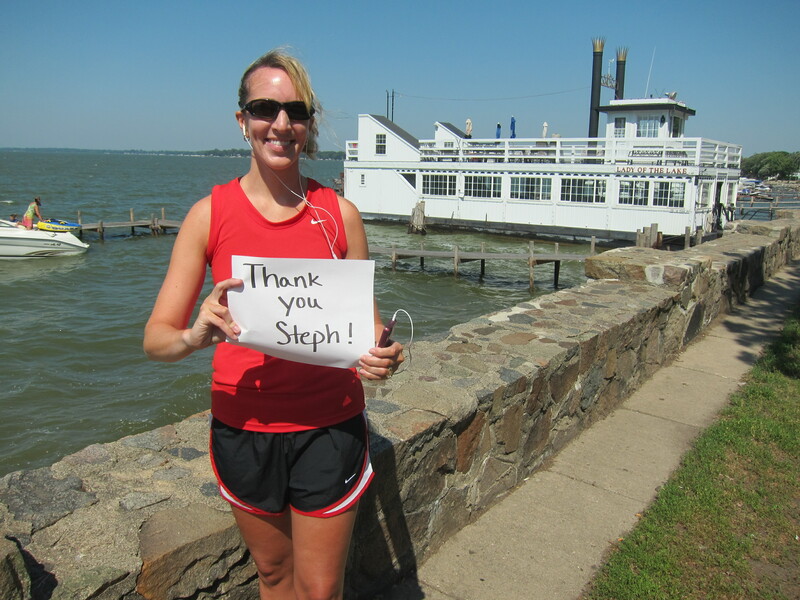 Thank you Stephanie! After a warm up jog we’re at the site of the last concert given by Buddy Holly, Richie Valens and The Big Bopper. 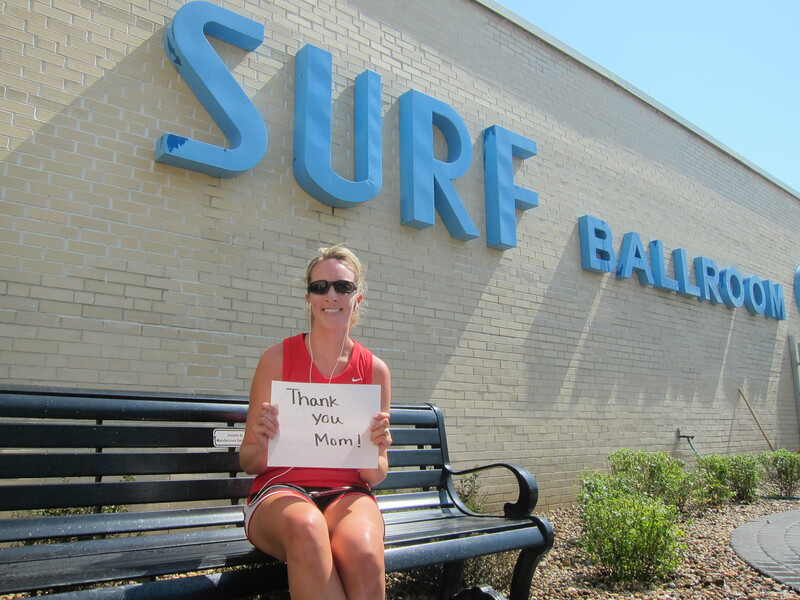 The Surf Ballroom is a definite stop for everyone. You can take a look around at all of the artifacts from each of the artists and there’s just something magical about it from the minute you walk in the door. We absolutely love going to concerts here, and I need to thank my mom for always taking time out to come and entertain the kids so we can get out every now and then. Thank you Mom! Here we are at the Clear Lake Fisheries Management Station. Fancy name, huh? 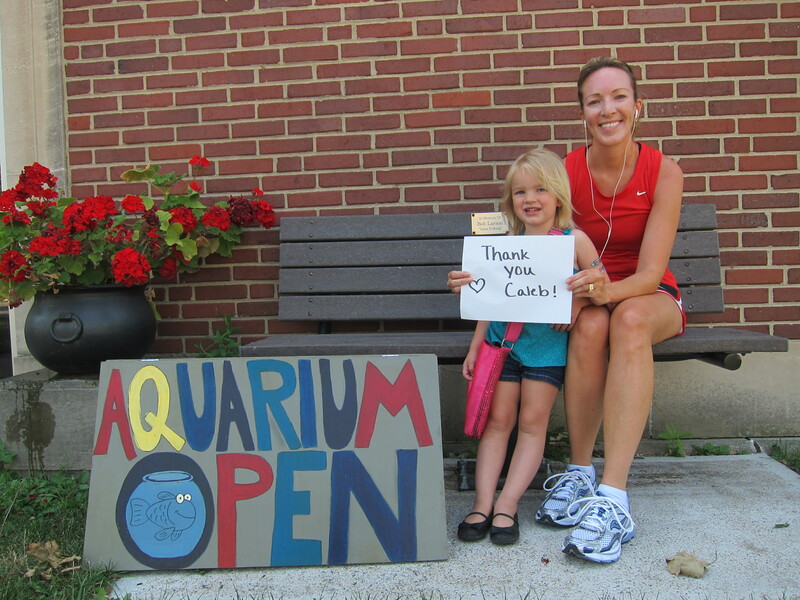 My son Caleb loves to see the sign “Aquarium Open” so he can take a look at all the big guys swimming in their tanks. He’s headed for 1st grade this year, and I can’t even remember what life was like before him. We moved here when Caleb was in preschool and he has really adapted well to lake living, taking advantage of the beach as well as the fishing. Thank you for being my sweet, mama’s boy. I love you Caleb! 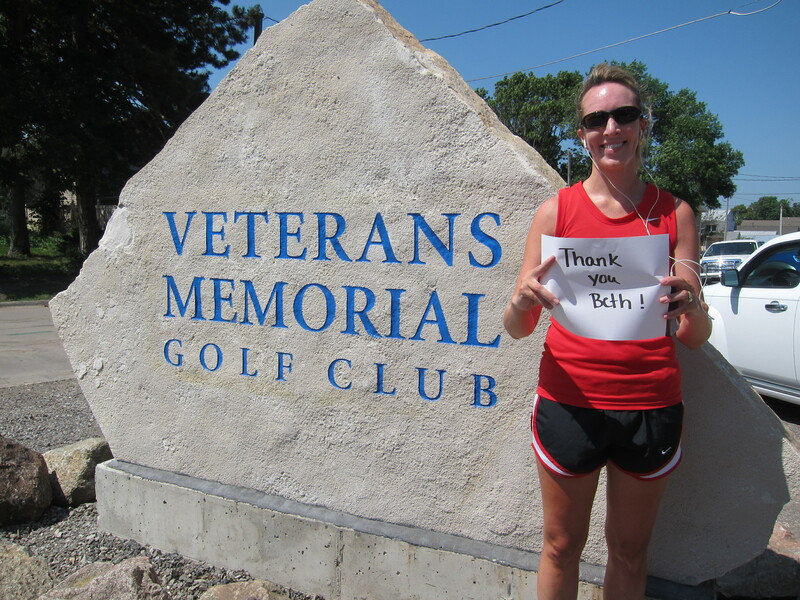 Down the road you can get in a round of golf at Veterans Memorial Golf Course. I haven’t personally tried it out because of an incident in high school where my drive went 90 degrees off the first tee…in front of the ENTIRE boys AND girls golf team…but someday I hope to dust off my clubs and try again. I want to thank Beth for being my first neighborhood friend. 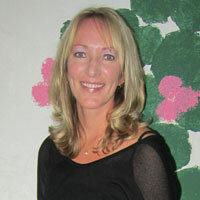 She lives around the corner and has a son the same age as Caleb. They like to get together and do boy things so we can catch up on life. Meeting new people can be intimidating and I am so grateful to have met her very shortly after we arrived in town. Thank you Beth for making me feel at home in my new home! This garage door is on my usual running path and it’s not really a stop, but it’s right across from the golf course. I love it because we’ve been to Maui a few times and it reminds me to relax (aka “hang loose”). I want to thank Jason and Mari for showing us around town with their Aloha spirit. They pointed us towards an area we’d like to live in, a rental while our house was being built and some great home-cooked meals. Thank you Jason and Mari! McIntosh Beach is a hidden gem with its sandy, instead of rocky, bottomed swimming area. It’s kind of a trek from the last stop and I was tempted to just jump in, but finishing up would have been tough with sand in my shoes. It’s all tucked away and a great place for an afternoon swim. I’d like to thank my friend Kathleen whom I have bonded with over our undying devotion to the Iowa State Cyclones. I love taking in games with her and getting together to let the kids play. Her girls are also exactly the ages of our kids so we’ll be seeing a lot of each other over the next several years. 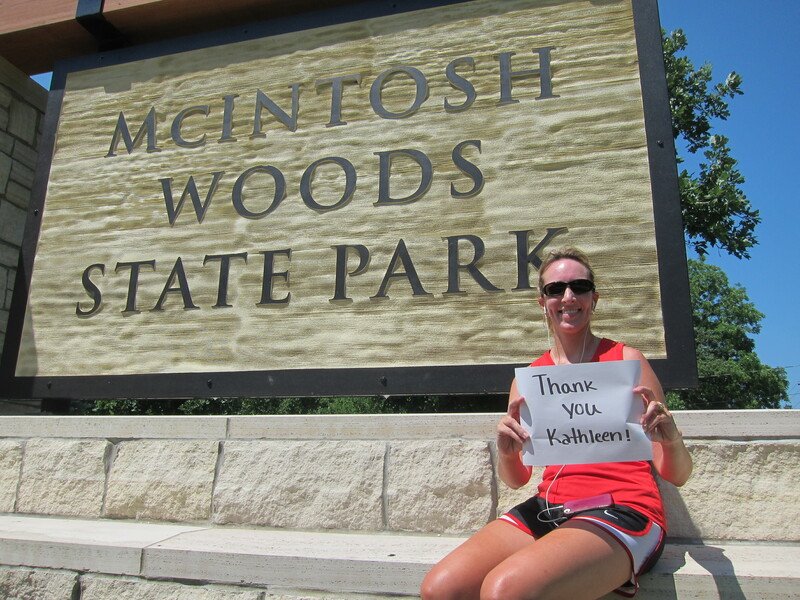 Thank you Kathleen! Go State! After you’ve worked up an appetite you can stop at The Muskie. It’s seasonal, May – September, and provides one of the only dining experiences on the lake. My daughter Lauren is a huge fan of their cheeseballs with a bowl of ranch the size of your fist. It’s her favorite part of the whole meal. You have to get there early before the crowd or you’ll be waiting awhile, but there is an outdoor beer hut where you can relax and sometimes they have live music to keep you entertained until it’s your turn. I want to thank my ranch loving little girl for the sass she brings to complete our family. 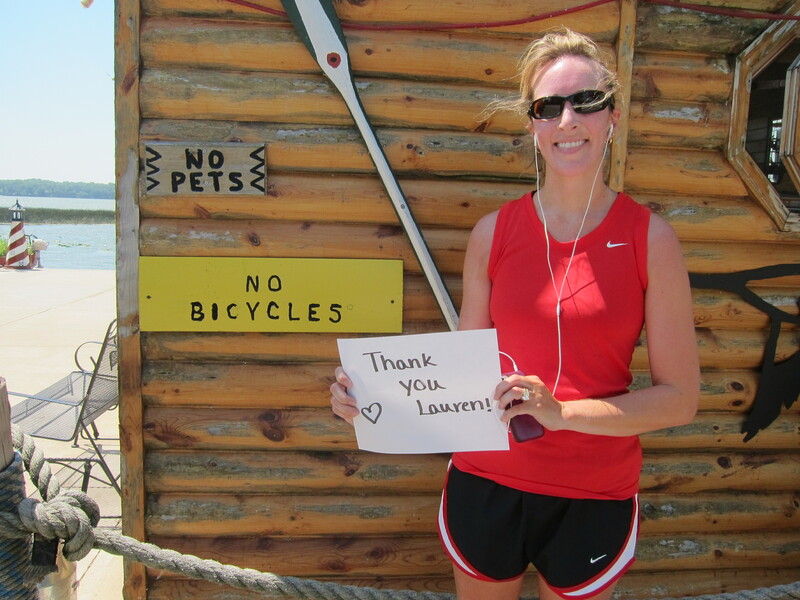 I love you Lauren! I had to take my picture next to these NO signs. It cracks me up because it’s the only restaurant I’ve ever been to with a list of rules a mile long posted on the door and on the menu. In addition to these two there’s also no credit cards, no pushing tables together, no reservations and my personal favorite… please keep your children under control or you will be asked to leave. It always reminds me of the “No soup for you!” episode of Seinfeld. My last stop, or stops, is where the rubber really meets the road. Over to my right is The Viking and behind me is Sugar and Slice. The Viking is only open from May – September, but it generally marks the beginning of warm weather and the soft serve raspberry yogurt is one of my summer time favorites. Sugar and Slice is open year-round and serves hand dipped ice cream plus pizza along with lots of other goodies. It’s been a really great addition to the area and I’m so thankful my husband Matt is willing to indulge me, on what may sometimes seem like a nightly basis, for a sweet treat. He is my high school “sweetheart” after all and after spending half our lives together he knows I always have room for ice cream. I love you Matt for all that you do for me and the kids to make memories that will last a lifetime. That concludes my tour of Clear Lake, IA. I hope you enjoyed it and maybe I’ll see you around town! As luck would have it, there is an opportunity coming up to run a 5K or a half marathon that goes all the way around the lake on August 31st. It starts at the Sea Wall and you can get more details at www.seawalltoseawall.com. What a brilliant post! Thank you for sharing all of these highlights! I agree that this episode was a liltte weak. I most definitely agree with Lisa that they are cramming too much information into one episode.In my opinion, when that happens, alot of things get missed and seem rushed. I brought this up last season. The season finale was overkill.If they took their time to tell the story, missing pieces would be much fewer.IMO pros/cons for this episode:Pros: Loved the dialogue between Emma and Snow. The anger Emma carried with her and finally the realization that Snow put her first. Snow did what she thought was best for Emma and now that action is understood. The mystery’ of why one corner of the land survived. I highly suspect Cora somehow protected it. Ironic how Cora wasn’t affected by the curse. It’s my belief she somehow concocted a protection spell. Emmas sarcastic modern day humor is enjoyable. Mulan Follow my lead, do what I say .step where I step and we might survive. Emma Thanks for the pep talk. I think we’ll be ok, I just killed a dragon last week Mulan Have you ever seen an ogre? Emma No, but I’m pretty sure I dated a few. Lancelot was Cora in present day. That twist was AWESOME.Cons: The beginning battle scene when King George’s men found Snow/Charming’s camp. When the dialogue between the main characters was happening, fighting was taking place in the background. It was awful. The extras were just lazily slapping swords together. Looked like they were handling fly swatters. There was no movement. They just stood there in one spot and went through slow motion movements. It drew my attention away from the dialogue because it was so bad. I felt no sense of danger for the main characters. Awful. The ogre looked ok, but his bark was worse than his bite. The ogre waled alot. That’s about it. It didn’t touch Emma or Snow. Ok, it knocked the gun out of Emma’s hand. The scene was HUGE. Out of all of that you would think the ogre could have knocked the cr#$ of a couple people ..even just one person. That scene was awful. When Henry opened the box of snakes, he was facing a wall. The entrance was behind him. Then Charming/David comes up IN FRONT of henry and shuts the box. Well, wouldn’t Henry have seen David come in before he opened the box? It was so bad I noticed it right away. The first thing I thought was.. Hey, where did he come from? . Badly done placement.The writers need to slow things down and fill in gaping inexplicable holes in their stories. There are WAY TOO MANY to list here. I understand the suspension of disbelief . I totally get it. That’s not what I’m talking about here. It’s the lack of explanation that’s killing them, especially when they build a story around it. Just give an explanation that’s all especially when you build around a point. Don’t just leave it there for people to say Hey, that’s not right .For example:First if was There’s no magic here . Umm ok, then how is the curse working? This is the whole plot in the first season. I think an explanation is in order and no once again I’m not talking about the suspension of disbelief. then . Magic is different here . Really? How? They brought it up like 5 times. After you bring it up that much, I think you need to elaborate.They need more action ALOT more action. Come on people, this is a story of heroes heroines and villains. I don’t mean they need to put in gory massive bloody scenes but at least give it more kick.IMHO, if they slowed down the storytelling and added more action, the action would offset the slowness of the storytelling. I’m not an expert (by any stretch of the imagination) but if it’s written and acted correctly, the audience would be very entertained. I think the writers have chosen a bad path to tell the story too fast just to keep people watching, that they are missing way too many finer points. Most people I talk too tell me things aren’t very well thought out. I have to agree with them. I already have 2 friends that have lost interest. I don’t want to see this series cancelled. The ideas and concepts are awesome which is why I like it. I hope the writers are listening to their fans. .